Seasonal Occurrence: Most likely to be seen June through August. Occasionally found at other times. Breeds in our area. Notes: The Least Bittern is the smallest North American heron and blends into its marshy habitat exceptionally well. Measuring only about 12-13 inches, these tiny herons have a long neck, with a dark brown to black crown and back blending to warm tan on the sides and tan and white stripes on the neck and underside. 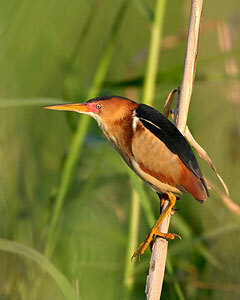 This coloring allows the Least Bittern to blend into the upright reeds and grasses where it prefers to forage. These small herons are light enough that they can easily move through the marsh by grasping the stems of standing vegetation. They will often perch between stems and strike down at the water to catch their prey, giving them access to water too deep for much larger herons. When startled the Least Bittern puts its fantastic camouflage to good use by freezing in place with its bill facing upwards and its striped neck and belly facing toward the disturbance. They are even known to sway gently in the breeze, mimicking the wind-blown marsh grass. The Least Bittern breeds in the eastern United States during the summer months and can be found in coastal areas of Central and South America in the winter. They prefer fresh and brackish wetlands with dense grassy vegetation and forage mainly on small fish and insects. Least Bittern populations are difficult to survey because of their inconspicuous nature, but the North American Breeding Bird Survey reported that their numbers appeared relatively stable between 1966 and 2015. This is good news, but they still face threats due to loss of wetland habitat and shifts in marsh vegetation, due to the expansion of invasive species. Next time you are near a dense grassy marsh, if you are very patient – or very lucky – you just might catch a glimpse of an elusive Least Bittern balancing on the cattails.